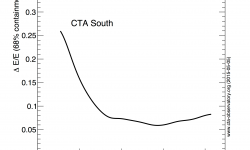 Please note: This is an archived page of a previous version of CTA’s estimated performance. 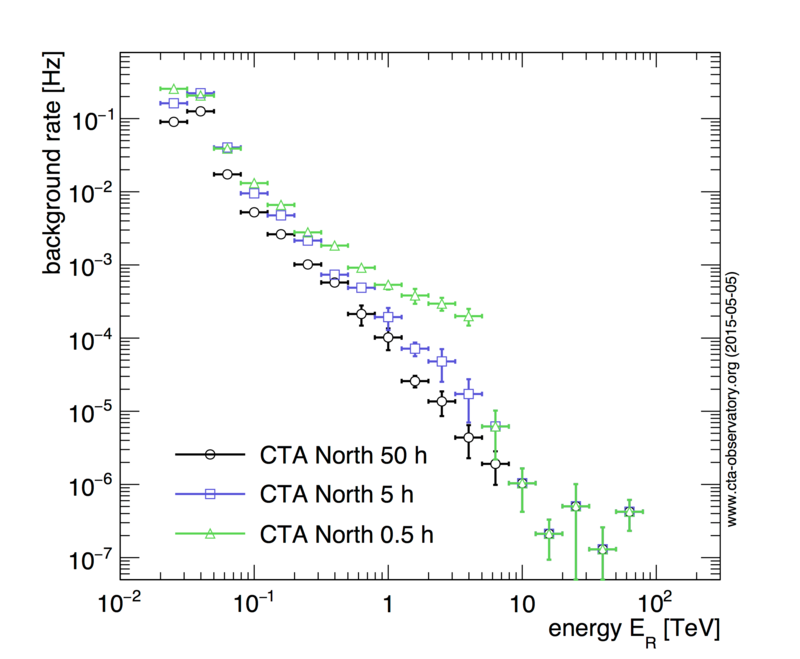 For the current performance page, go to www.cta-observatory.org/science/cta-performance/. 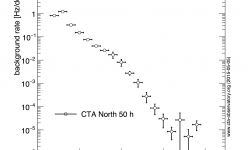 The plots and linked files on this page represent the baseline performance expected from CTA. Note that evolution of the performance is expected as analysis algorithms improve and the final site and configuration are fixed. 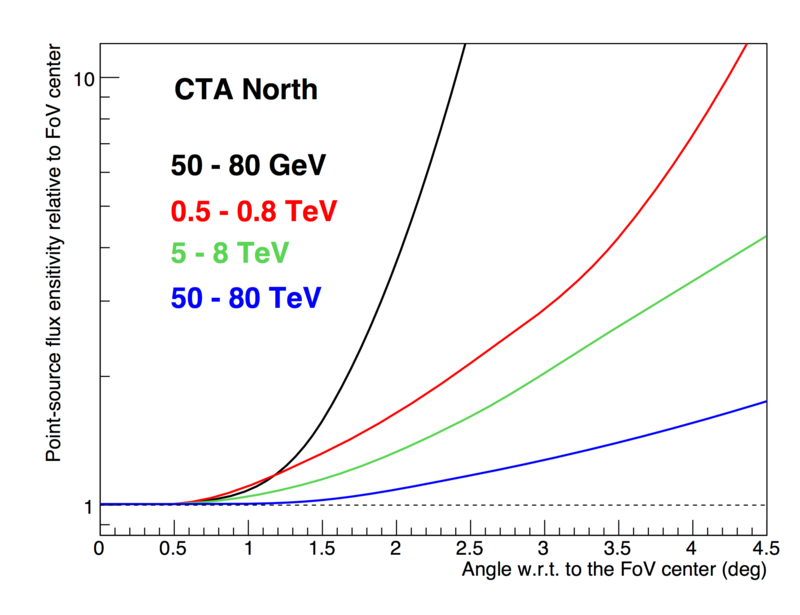 The below table compares the performance of CTA with a selection of existing gamma-ray instruments. 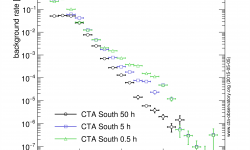 CTA differential energy flux sensitivity for five standard deviation detections in five independent logarithmic bins per decade in energy. 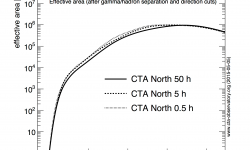 Additional criteria applied are to require at least ten detected gamma rays per energy bin and a signal/background ratio of at least 1/20. 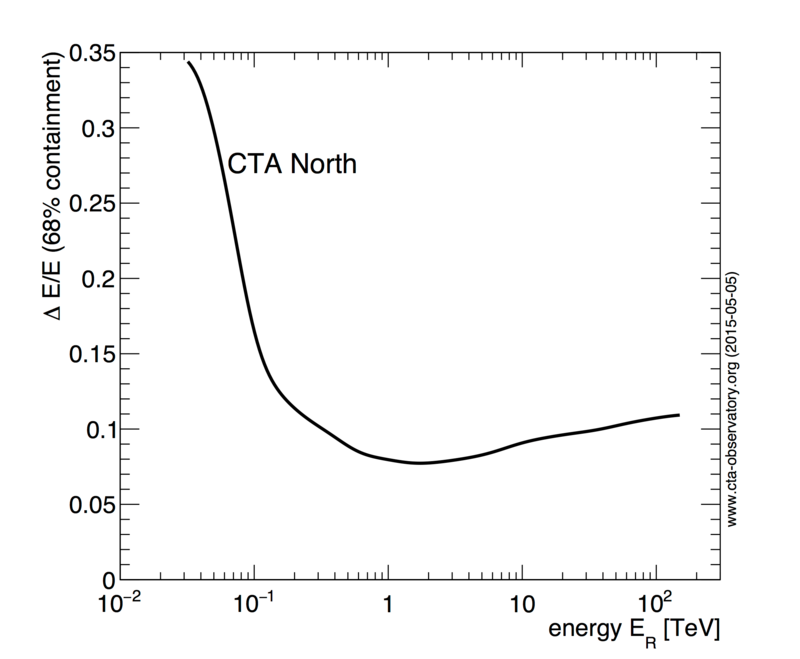 The curves for Fermi-LAT and HAWC are scaled by a factor 1.2 to account for the different energy binning. The curves shown above give only an indicative comparison of the sensitivity of the different instruments, as the method of calculation and the criteria applied are different. 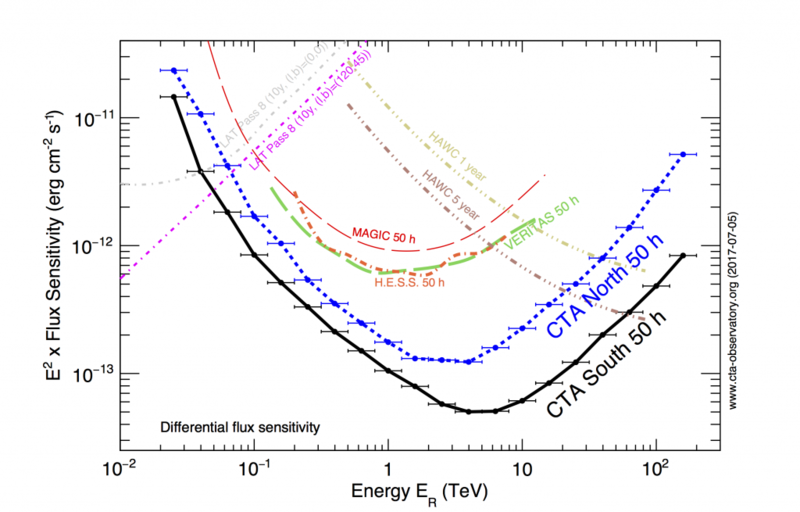 In particular, the definition of the differential sensitivity for HAWC is rather different due to the lack of energy reconstruction for individual photons in the HAWC analysis. 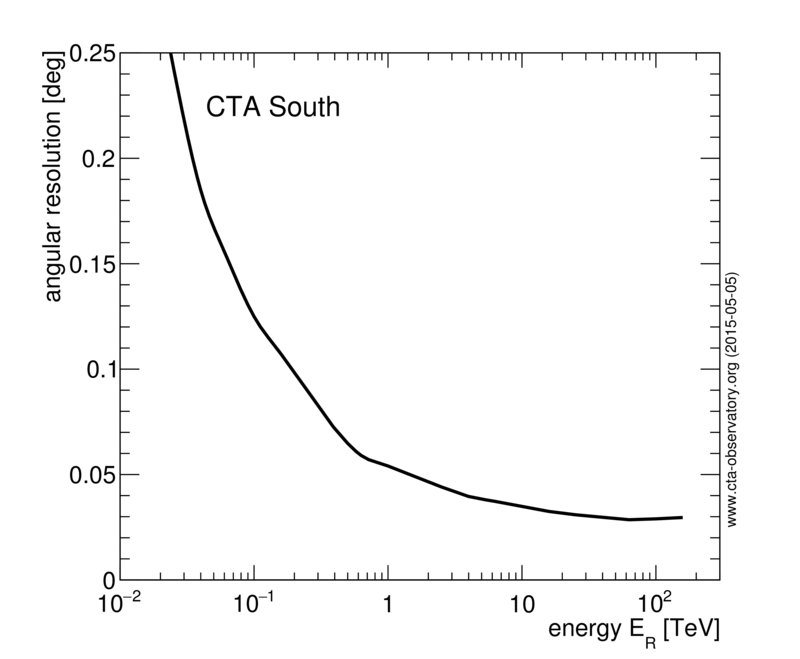 The angular resolution vs. reconstructed energy curve shows the angle within which 68 percent of reconstructed gamma-rays fall, relative to the true direction. 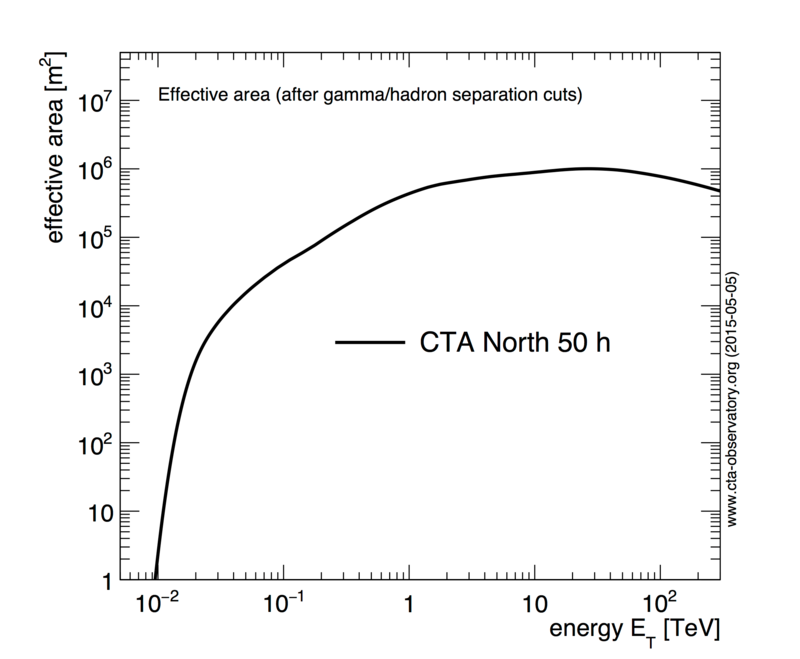 Gamma-hadron separation cuts are applied for the MC events used to determine the angular resolution. Note that this analysis is not optimised to provide best angular resolution, but rather best point-source sensitivity (compatible with the minimum required angular resolution); higher resolution is possible at the expense of some collection area. 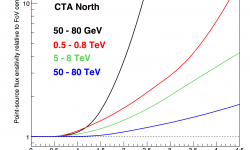 The energy resolution as plotted is defined as the half width of the +-34 percent interval around the most probable reconstructed energy, divided by the most probable reconstructed energy (see Figure 67 in Ackermann et al. 2012). It is derived from the energy dispersion matrix, which is included in the instrument response files attached to this page. The migration matrix has been smoothed to remove tails which were not significant with the available MC statistics. Rows of constant true energy ET have been normalized to one, hence showing the probability density function of reconstructed energy (ER) for a given true energy ET value. 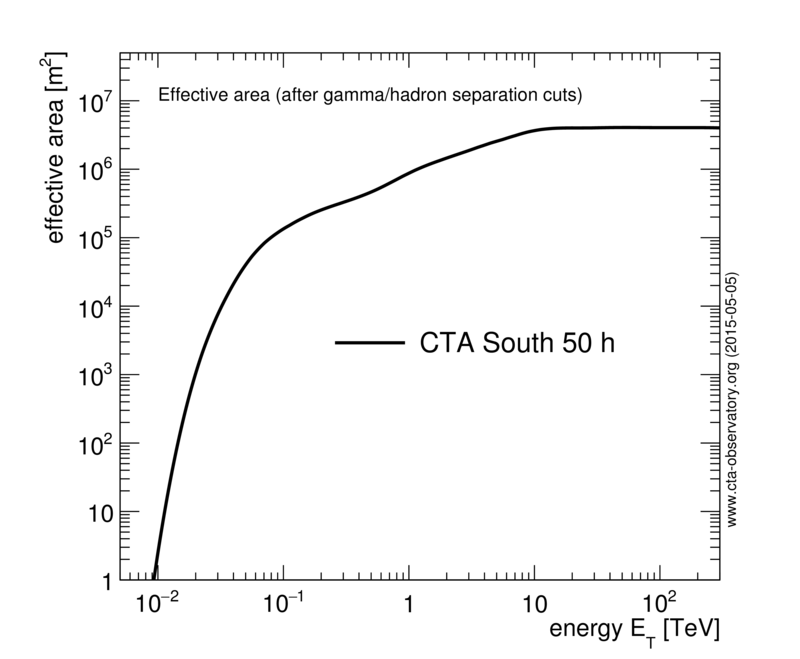 Note that gamma-hadron separation cuts (including a telescope multiplicity cut) were optimised in coarse bins of ER (five per decade), which sometimes results in noticeable acceptance jumps. 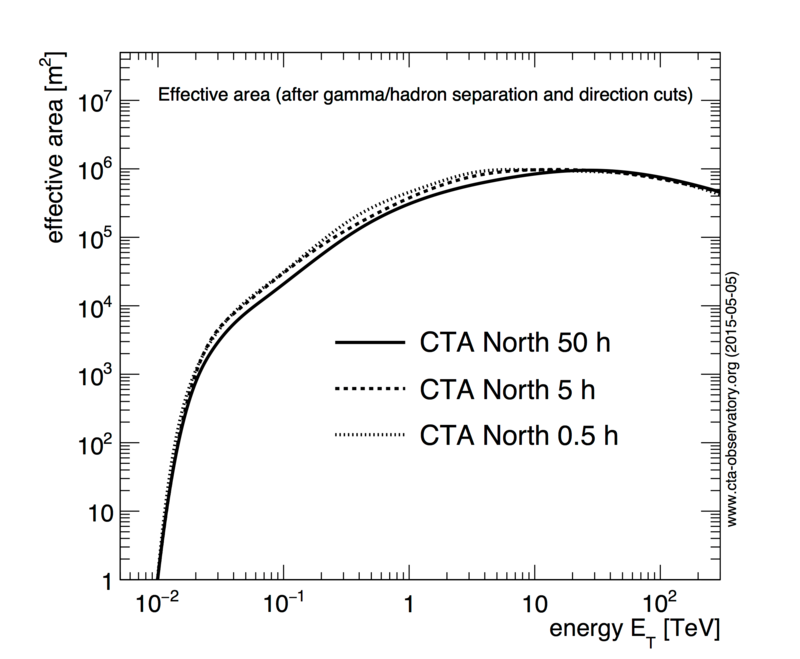 The effective collection area for gamma rays after gamma-hadron separation cuts vs. true energy ET is given below. This curve corresponds to the 50-hour sensitivity curve given above, collection areas are somewhat larger for the sets of cuts optimised for shorter observations. 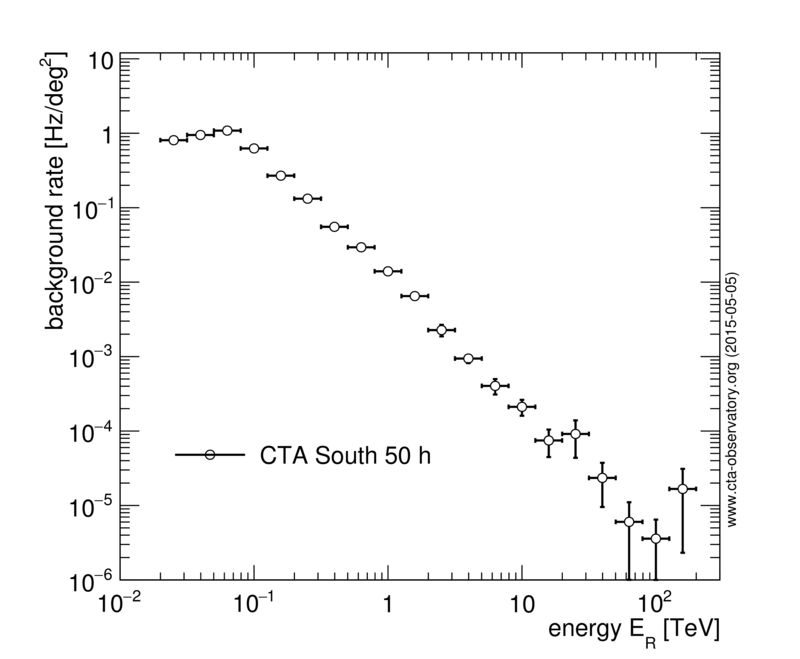 The collection area after gamma-hadron separation and photon direction cuts (optimised for different observing times) vs true energy ET. 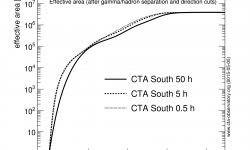 The residual cosmic-ray background rate vs reconstructed gamma-ray energy ER is shown below. 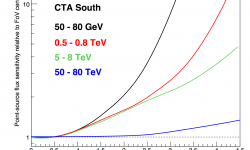 The rate is the one integrated in 0.2-decade-wide bins in estimated energy (i.e. five bins per decade). 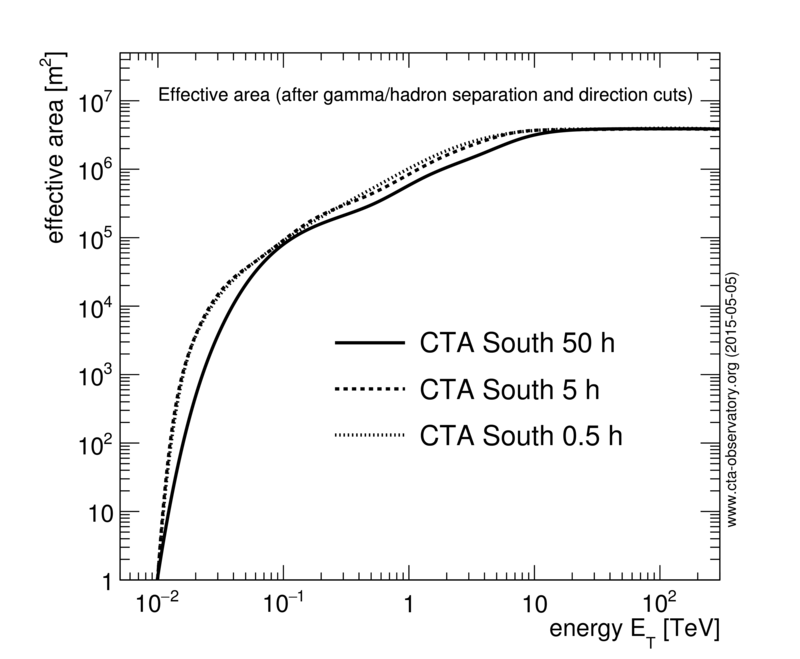 Gamma-hadron separation cuts optimised for different observing times are applied to the selection of simulated cosmic-ray proton and electron events; a cut on arrival direction, optimised (energy-wise) for best sensitivity to point-like gamma-ray sources, was also applied (the same as for the plots above). 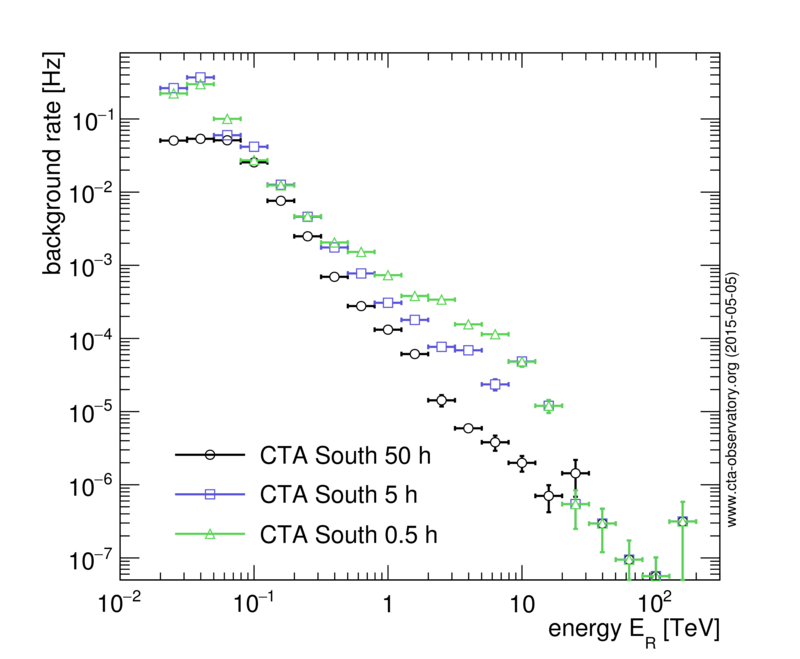 For details on the assumed cosmic-ray proton and electron spectra, see Bernlöhr et al 2013. 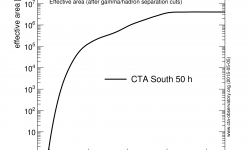 The residual cosmic-ray background rate per solid angle vs reconstructed gamma-ray energy ER is shown below for 50 h-optimized cuts. 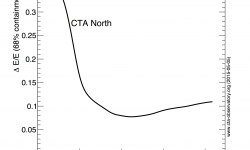 This, together with the angular resolution (assuming gaussian PSF) and the gamma-ray collection area without angular cut, can be used to simulate the CTA performance to moderately extended sources in the central part of its FoV. 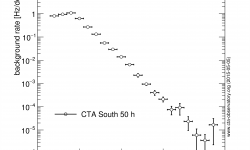 The performance parameters presented above are valid for a source located close to the center of the CTA field of view. 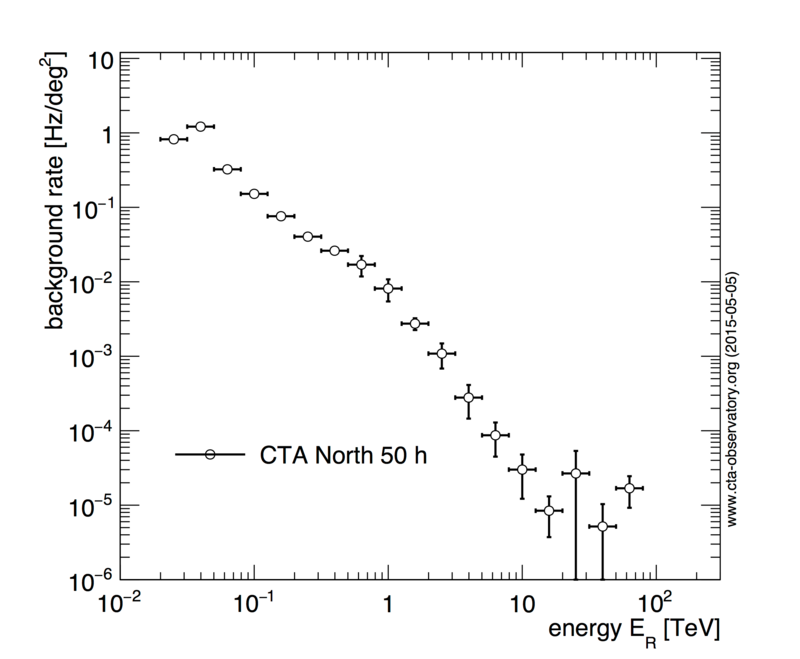 The plots below show the relative off-axis sensitivity (normalized to the one at the center of the field of view) for four different energy bins, and allow estimating the source detectability off-axis. 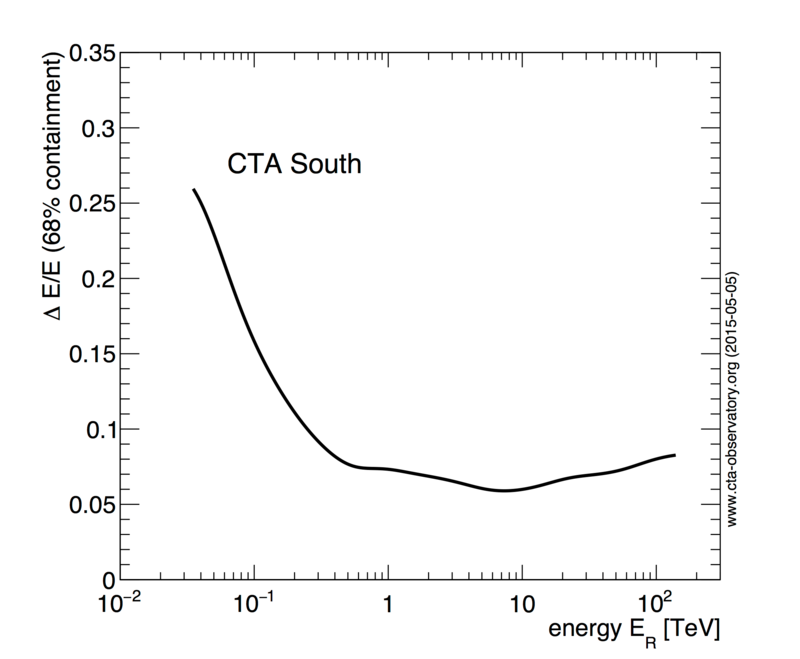 It should be noted that angular and energy resolution are also degrading at the edges of the field of view, and hence detailed simulations of observations of gamma-ray sources at large offsets (>2 degree) or of very extended sources are not possible with the instrument response functions provided here. 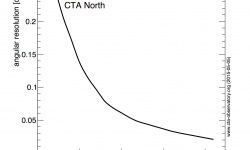 All performance values are derived from detailed Monte Carlo (MC) simulations. 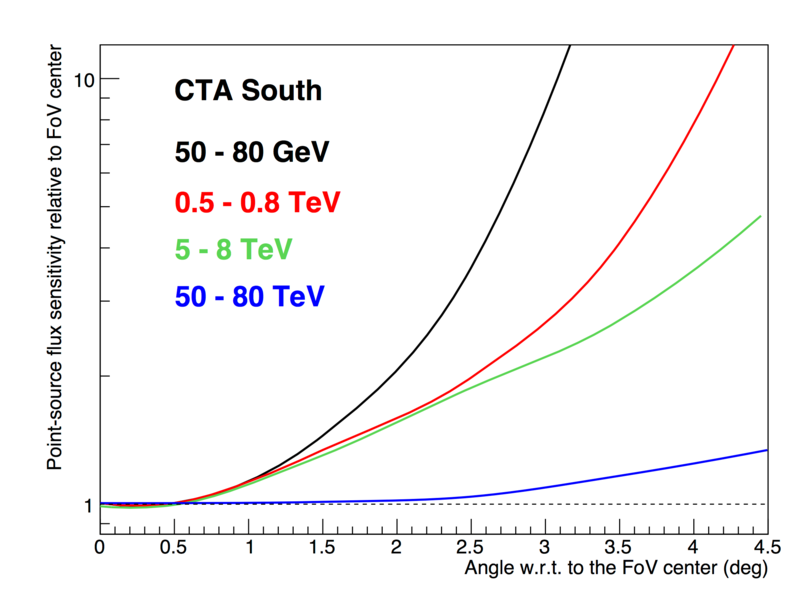 The MC simulations are similar to the one presented in Bernlöhr et al 2013 but are for an updated detector model of the CTA telescopes (so called ‘Production 2’). A point-like gamma-ray source with a spectral shape similar to that of the Crab Nebula is assumed in the following, located at the centre of the field of view and observed at a zenith angle of 20 degrees. 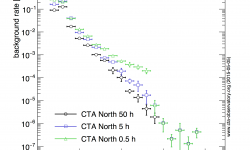 The performance values can be used for the simulation of point-like and moderately extended gamma-ray sources. 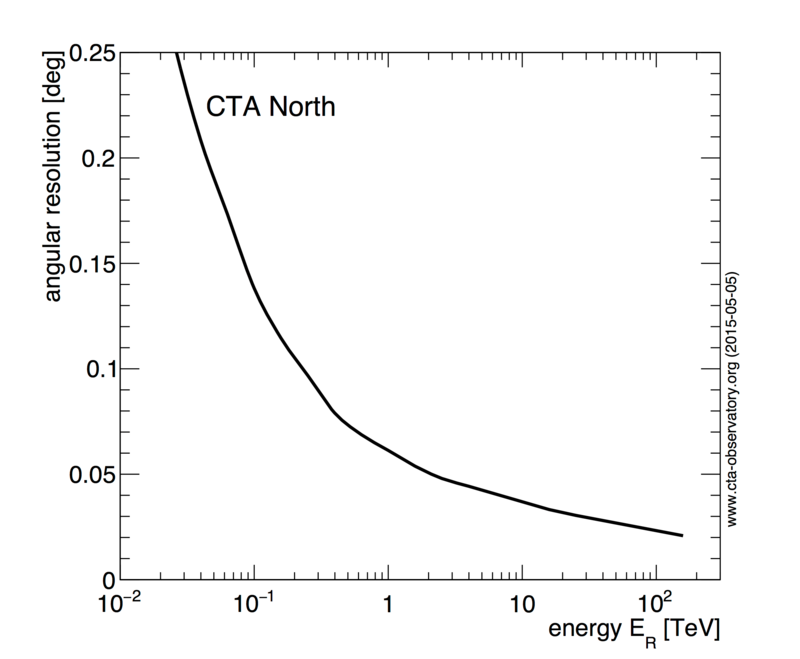 It should be noted that especially the energy migration matrix is strictly valid only for a point-like source. The more extended the source, the less valid is this migration matrix. 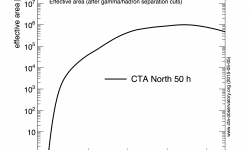 The performance also depends on the location of the assumed gamma-ray source in the camera. Full information is provided only for sources located in the central part of the field of view. Two independent analyses of the Monte Carlo sample have been carried out, yielding similar results. The analyses are “classical” ones, based on parametrised shower images, some improvement is expected with the use of more sophisticated techniques fully exploiting pixel-wise information. The instrument response functions from the plots on this page can be downloaded in the below formats.